A Photo Competition for the International Year of Crystallography 2014 in collaboration with Agilent Technologies Inc. 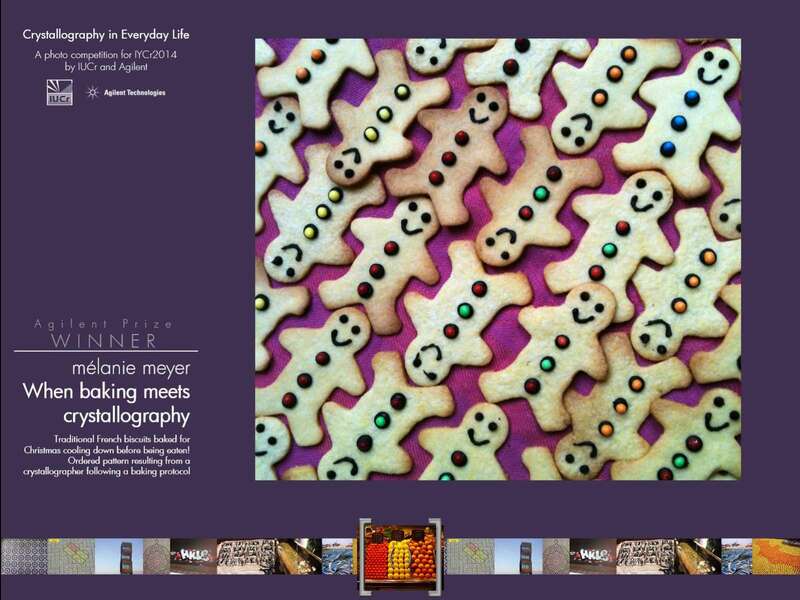 The International Union of Crystallography and Agilent Technologies invited amateur and professional photographers to submit stunning images that capture the spirit of crystallography in the places, objects and experiences of everyday life. 254 entries were submitted to the competition. Two winners received a USD 1000 bursary, sponsored by Agilent Technologies, to attend the IUCr Congress in Montreal in August 2014. A third prize winner was selected as the "Crystallographers' Choice" of the 29th Biennial Conference of the Society of Crystallographers in Australia and New Zealand in April 2014. The 3 winning and 13 most highly commended entries were used in a celebratory Agilent/IYCr2014 Academic Calendar for 2014/2015. The winning and other noteworthy entries were exhibited during the Montreal Congress and can be viewed here. Traditional French biscuits baked for Christmas cooling down before being eaten! Ordered pattern resulting from a crystallographer following a baking protocol. 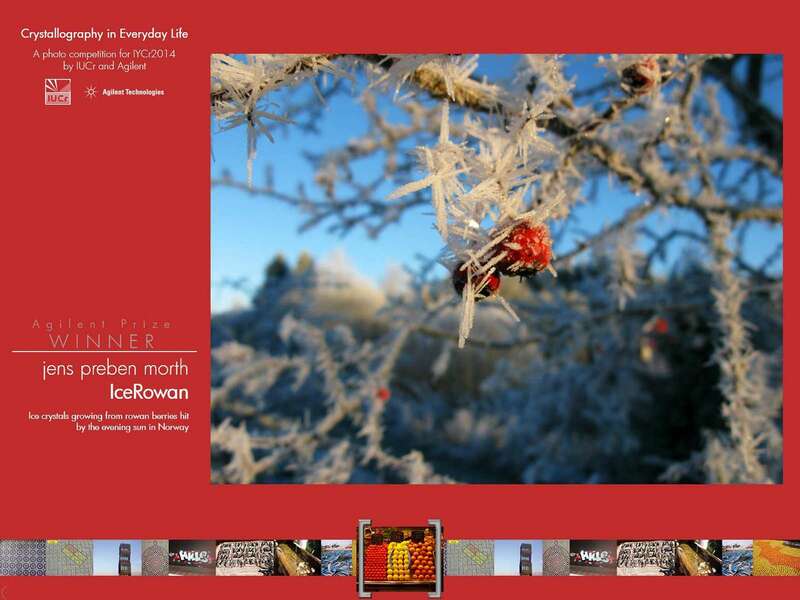 Ice crystals growing from rowan berries lit by the evening sun in Norway. 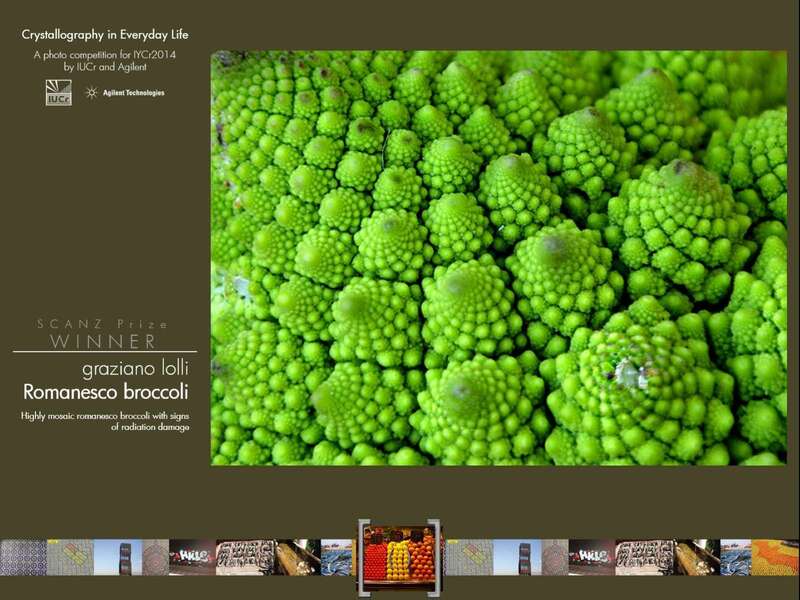 Highly mosaic romanesco broccoli with signs of radiation damage. These works are licensed under a Creative Commons Attribution 2.0 UK: England & Wales License. Agilent Technologies Inc. is a world-class manufacturer and supplier of life science and chemical analysis instrumentation, including a complete portfolio of single-crystal X-ray diffraction systems for chemical crystallography and structural biology. Click on the image to find out more.